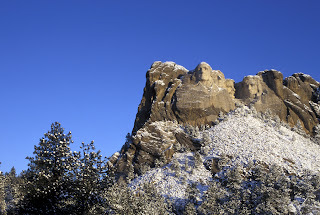 As I said in an earlier post, winter is the best time to shoot sunrise on the faces at Mount Rushmore. 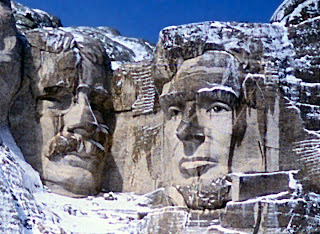 With the sun in the southern sky, the shadow from Lincoln's face on Roosevelt's is much less of a problem than in the summer. Snow on the heads adds an interesting element that not a lot of people see. Rain at other times of the year provides the same problem. I've actually seen a rainy day photo of Rushmore used in a supermarket tabloid with the headline, "Stone heads crying real tears! Scientists are baffled!" Hit things on the right day and with cold enough temperatures to keep the snow from melting and you've got the combination for some great shots. 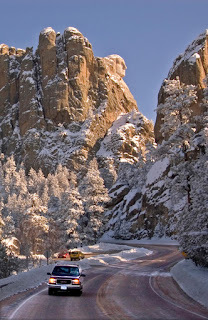 Great winter photos. I even like the "crying" look.